1. Which "wrongfully condemned" and "imprudently opposed" man said nature abhors a vacuum? 2. George Bernard Shaw is the only person to have won which award and prize? 3. Who were the youngest winners of the mens and womens singles title at the French Open? 4. Mind your language, what can be a small coin or a large detention? 5. Who ordered a steak and vanilla coke from Buddy Holly? 6. "With a knick, knack, paddy whack, give a dog a bone". What is a paddy whack? 7. In the book and film The Right Stuff from Tom Wolfe, what were the pilots "pushing"? 8. What change did the Rolling Stones have to make to their song Lets spend the night together on the Ed Sullivan Show? 10. What do scorpions, the Niam-niams of Africa, Aesop and the men of Kent all have in common? 2. Academy award (for adapted screenplay "Pygmalion") and the Nobel prize for literature. 6. An Irish wag (jester or buffoon) This Old Man is a nursery rhyme of unknown origin. The rhyme and its associated tune have become well-known in popular culture through several renditions and parodies. The rhyme was originally better known in the United Kingdom than the United States; however, this changed with the 1958 film The Inn of the Sixth Happiness. In fact, the usage of the song in this film was so popular that it led to a hit single by Mitch Miller titled The Children's Marching Song. 7. "Pushing the envelope" beyond the limit. The Right Stuff is a 1979 book by Tom Wolfe about the pilots engaged in U.S. postwar experiments with experimental rocket-powered, high-speed aircraft as well as documenting the stories of the first Project Mercury astronauts selected for the NASA space program. The Right Stuff is based on extensive research by Wolfe, who interviewed test pilots, the astronauts and their wives, among others. 8. Change the words to "Lets spend some time together". 9. Daguerreotype The daguerreotype (original French: daguerr?otype) is an early type of photograph, developed by Louis Daguerre, in which the image is exposed directly onto a mirror-polished surface of silver bearing a coating of silver halide particles deposited by iodine vapor. In later developments bromine and chlorine vapors were also used, resulting in shorter exposure times. The daguerreotype is a negative image, but the mirrored surface of the metal plate reflects the image and makes it appear positive in the proper light. 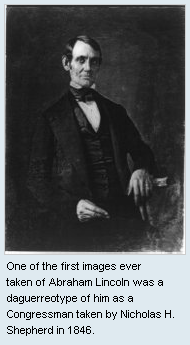 Thus, daguerreotype is a direct photographic process without the capacity for duplication. Once upon a time, it was said that members of the Niam-niam tribe were born with tails. As punishment for the murder of Thomas a Becket, men of Kent 'are' born with tails.